The Vu Iconium UHD Smart TV is one of the best value-for-money propositions around. If your heart is set on a 4K television, this is a very good option to consider. At Rs. 49,999, it falls in the budget range for such TVs, but the compromises that Vu has made are definitely worth the price. Thin, light and good looking are three things that have been adding to the cost of consumer technology equipment for a while now. On this light, there are companies like Vu, which keep reminding the customer that a balance is possible. Vu’s TVs aren’t as thin as Sony’s or Samsung’s, and they’re nowhere close to being as premium-looking, either. In fact, they don’t match up to those in terms of picture quality either, but they still end up bringing humongous value for money. Point in hand, the 50-inch Vu Iconium UHD Smart TV is among the best TVs for most of us who cannot spend about Rs. 1 lac that Samsung, Sony, LG and some others quote, for good TVs. It’s not the perfect TV, but Vu’s market comes from the fact that the best in the market want you to spend more than what many earn in a year. More importantly, Vu is to this market what Samsung and others are to the premium television market. While Micromax, InFocus and Intex compromise on design elements, Vu strikes a pleasant balance. Here’s how. At Rs. 49,990, the Vu Iconium is a budget television as far as 4K TVs go. Having said that, nothing about the design will tell you so, unless you take a really close look at it. On the face of it, the chrome finish on the bezels and stand look quite premium, while the TV isn’t very heavy either. If you’re building a media centre, this TV will fit right in. Without the stand, the television weighs 13.8 kgs, while the stand adds another 0.3 kilos. You can wall mount it as well, and the accessory is included in the box. The Vu Iconium isn’t as slim as high-end TVs from Sony and Samsung, but the thickness is again kept at a reasonable level. Of course, there’s a bulge near the center, on the back of the television. The Iconium 50 inch 4K TV is also very easy to set up. If you’re not wall-mounting this TV, it takes less than five minutes to set up. The stands are easy to put in place, and once they are screwed in, your TV is ready to go. Four HDMI ports, combined with two USB 2.0 and one USB 3.0 port is good. 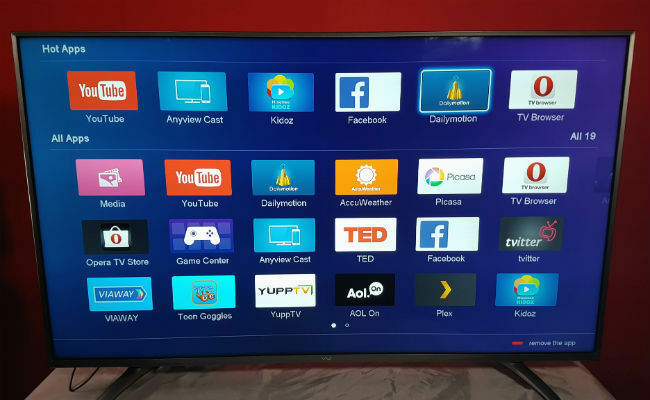 It allows you to connect almost every device that you want to on this TV. I only wish Vu could have included one more USB 3.0 port, even if at the expense of a USB 2.0 port. For a 4K television, USB 3.0 ports are essential, and a future proof TV would allow more such inputs. Port placement is well thought out. 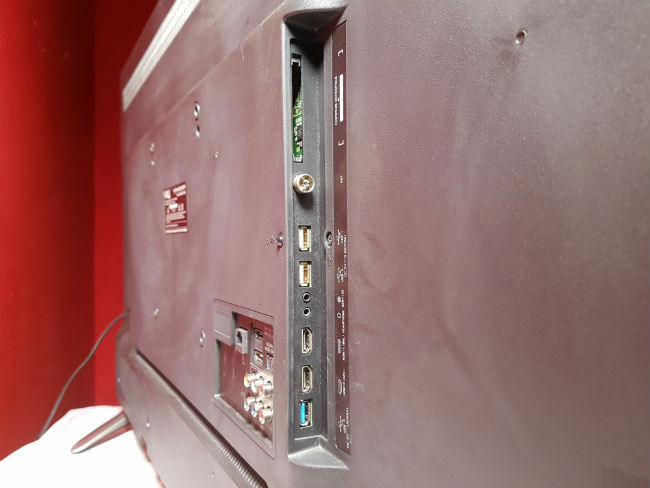 There are two HDMI ports on the side, where you can connect devices that you require to remove intermittently. Devices like your set top box and Chromecast, which will usually be attached perennially to the back of the TV, should be attached to the two ports placed at the center console on the back. The Component and Composite ports are also placed here. To the most important part, then. As I mentioned in the beginning of this review, compromises have been made, but none that the price won’t justify. The display panel on the Vu TV doesn’t have the best viewing angles. There’s a visible colour shift from a fairly straight viewing angle. It doesn’t overtly hamper the experience, but if you’re a stickler for colour accuracy, you’d notice it. What’s worth appreciating about the picture quality is the upscaling engine. It works hard to keep the quality as good as possible. If you’re primarily viewing high quality HD content, like on Netflix, or mildly compressed 1080p movies, you should have no problem with this TV. If you can get your hands on some 4K content, the same applies. SD content does stick out a little bit, but again, it isn’t enough to really complain, and not just because of the price. 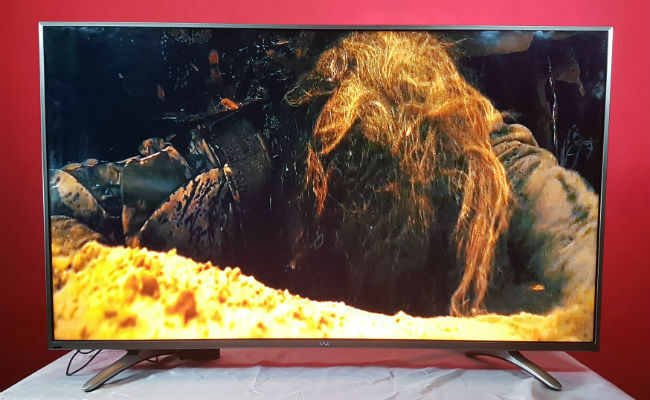 Most of the high definition TVs today struggle with SD content but to varying extent, and the Vu Iconium UHD 50-inch is far from the worst that you'll see around. The problem with upscaling is one of the main reasons why you shouldn’t be buying any 4K TVs right now. The colours are decent, but perhaps a tad undersaturated. Surprisingly, local dimming doesn’t seem to aid the blacks on this TV. In movies like Gravity, set in deep space, the blacks were not ideal. The Standard picture mode is slightly dull, while the dynamic mode adds a bluish tinge. The Natural mode was my pick, but you may choose another. In general, you’ll get the best out of this TV by tweaking the picture, contrast, brightness and colour parameters by yourself. Lastly, the sound output of the TV is somewhat low. If you’re in a large room, you would possibly want to get better speakers, but moderately sized rooms should be fine with the two 10 Watt speakers. Vu has done a good job in making the UI on this TV faster and more responsive. Although it is not as good as LG’s WebOS or Android TV on Sony’s latest models, it is much improved from other Vu TVs that I’ve seen before. The UI is fast and responsive, and you don’t have to keep mashing buttons on the remote only to realise that the TV wasn’t fast enough to respond. A grid of apps are presented on the screen, which include Netflix. Incidentally, this is also one of the few Netflix-certified TVs in India, at the moment. You can launch the app by pressing the dedicated Netflix button on the remote. If your heart is set on a 4K television, then the 50-inch Vu Iconium UHD TV is easily the most value-for-money pick at the moment. At Rs. 49,990, it delivers good performance for the price that you pay. 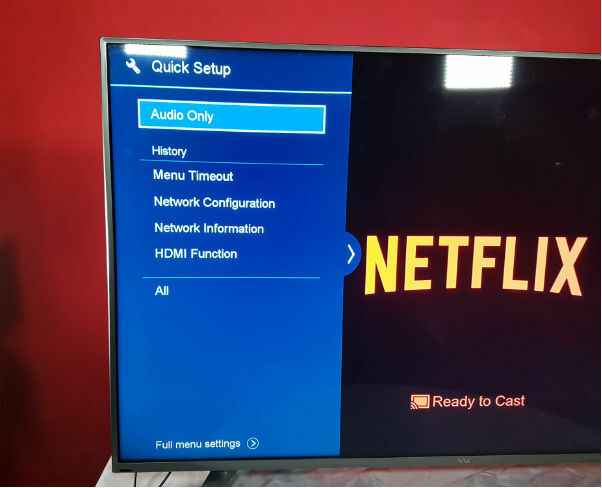 It has ample ports for you to connect other devices or media, and is best suited for those who stream a lot of their content, or at the very least, don’t depend on regular SD television broadcasts.